For more than 30 years we have been developing and manufacturing high-grade food supplements. We are actively involved and advise our customers concerning the product, product files and food safety issues. Want to know more about Microz? Microz is your partner for the development of food supplements, in any large or small quantities. With our 30 years of knowledge and experience we can offer a complete service package, from product development to finished product. We are also your partner for advice about EU legislation, food safety issues, requirements for communication and packaging et cetera. We are specialists working for you in every step from formula development, sourcing of ingredients, mixing and production to packaging and shipping. 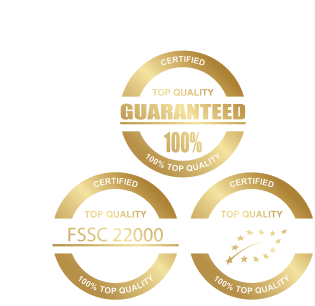 We are a FSSC 22000 and cGMP certified company and look forward to working with you, innovating and developing together. Microz produces the specified formula on the instructions of the client. In consultation, adjustments can be made to the composition in order to improve the processability of the product. If you prefer to take care of the end process of the production yourself, we can deliver the capsules, tablets, powders and balms in bulk (hygienically packed). Microz can also deliver according to a ‘full service concept’. This means we not only take care of the formula, the mixing and the capsuling/tableting, but also of the blistering, filling, potting, labelling and packaging. You can choose to have Microz carry out one or several phases of this process. Although delivery times are of course project-related, Microz is proud of its reputation as a supplier that can offer short lead times at a highly competitive price. Microz is thé address for large and small quantities. Large and small quantities. Fast en decisive. Over 25 years of experience and innovative. A complete range in a socially responsible jacket. The concerned partner that really contributes. All Those Unique Selling Points assist Microz in serving only one goal: your satisfaction! Microz, your supplement.